Colorism and color bias—the preference for or presumed superiority of people based on the lighter color of their skin—is a pervasive but rarely openly discussed phenomenon, one that is centuries old and continues today. 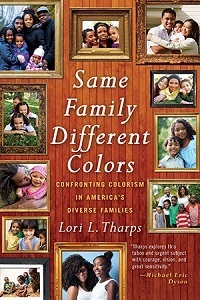 In Same Family, Different Colors, journalist Lori Tharps, the mother of three mixed-race children with three distinct skin colors, uses her own family as a starting point to explore how skin-color difference is dealt with in African American, Latino, Asian American, and mixed-race families and communities. Along with intimate and revealing stories and anecdotes from dozens of diverse people from across the United States, Tharps adds a historical overview and a contemporary cultural critique. Same Family, Different Colors is a solution-seeking journey to the heart of identity politics, so this more subtle “cousin to racism,” in the author’s words, will be acknowledged, understood, and debated.